Asked whether the Pikalevo problem could have been settled “without the intervention of Prime Minister Vladimir Putin”, Deripaska replied; “I think, yes. Someone with personal interests wished to manipulate the situation. Who? — I do not know.” Putin’s intervention was, he added, “a dangerous precedent”. Here’s that story in the larger context of the time. On Monday of this week Putin was on an inspection visit to the Sochi Olympic Games site, when he attacked the owner and operator of the Sochi airport. That’s Deripaska — but Putin didn’t name him. Noone else at the meeting did either. Were they all pretending? If the President or his men had googled the question, who owns and operates Sochi airport? They could not have been in the dark that the answer is Deripaska. When it comes to Putin’s footprints, were those his on Deripaska’s neck this time round? “Chernyshenko: …Today, the first exercises were held in the main operations centre. We have seen cases that are related to the closure of the Sochi airport due to weather conditions , the aftermath of a storm, damage to heating networks. VLADIMIR PUTIN: Who controls the airport, by the way? Chernyshenko: Sochi Airport is operated by Basel-Aero, a private company. VLADIMIR PUTIN: Is there anybody who is controlling what is happening at the airport? Chernyshenko: Of course. In the near future, in October an international certification has been scheduled for IATA (the International Air Transport Association), which must confirm as stated in our bid-book the airport capacity for 3,800 passengers per hour. VLADIMIR PUTIN: The capacity needs to be provided at a high quality level. For quality of service an airport must be good. Who watches this? Chernyshenko: Airport and training activities are included in the comprehensive plan of preparation for the Games . And the State Commission on the upper level of control. When Putin addressed Deripaska at Pikalevo three years ago, his Russian diction was pithy, unmistakeably clear. This time his syntax is complicated, the meaning garbled and evasive on the key point Putin claimed not to know – who is responsible for the quality of service at Sochi Airport. Chernyshenko’s report on testing the readiness of Deripaska’s constructions at Sochi is a guarded reference to the failure of Deripaska’s harbour works in December 2009 when a high-speed wind storm of the kind that is well-known on the Black Sea coast wrecked piers and berths, and demonstrated that Deripaska’s construction company had failed to anticipate or guard against storm damage. Over what ought to have been a simple matter both Putin and Chernyshenko were almost tongue-tied. 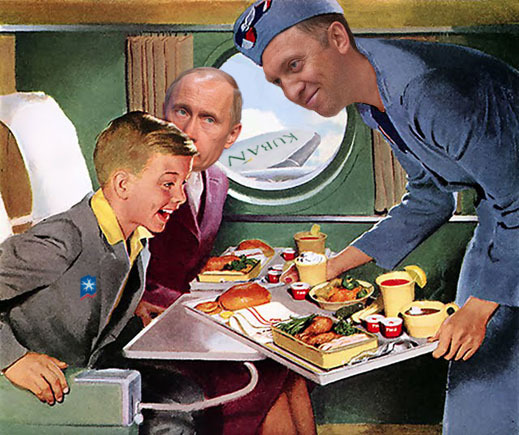 Putin omitted to ask, and Chernyshenko omitted to explain why the owner of Sochi International Airport, aka Deripaska, could be relied on to solve the problem of passenger service in the terminal, after the local airline he has also owned and operated, Kuban Airlines, recently collapsed into bankruptcy. The circumstances of that were explained this way by the company. In May the Krasnodar region’s transport prosecutor announced that he was investigating allegations that the bankruptcy was rigged. Basel-Aero was asked to comment on the President’s criticism; it has not replied.